This thread is for discussion of ocean heat content. Since I wrote that statement, I have become convinced that since deep ocean heating is diffused through relatively large volumes of the ocean (as indicated in the NOAA study), it cannot suddenly reappear in the atmosphere. Indeed, we can now monitor with the Argo network in order to assess if there are large amounts of heat (in Joules) migrating towards the surface of the ocean. This is a very important result, taken in context with the paper above. It means there has been no positive radiative imbalance FTOA since 2003. The Earth is in steady state. This implies Trenberth and therefore Hansen are incorrect in their adherence to a 0.85 W/m2 radiative imbalance at TOA. Vélez-Belchí, Pedro, Alonso Hernández-Guerra, Eugenio Fraile-Nuez, Verónica Benítez-Barrios, 2010: Changes in Temperature and Salinity Tendencies of the Upper Subtropical North Atlantic Ocean at 24.5°N. J. Phys. Oceanogr., 40, 2546–2555. Strong interest in multidecadal changes in ocean temperature and heat transport has resulted in the occupation of the North Atlantic Ocean hydrographic transect along 24.5°N five times since 1957, more than any other transoceanic section in the world. This latitude is chosen because it is where the northward ocean transport of heat in the Atlantic reaches its maximum. An analysis of the five oceanographic cruises at this latitude shows that there has been a significant cooling of −0.15°C in the upper ocean (600–1800-dbar range) over the last 7 years, from 1998 to 2004, which is in contrast to the warming of 0.27°C observed from 1957 to 1998. Salinity shows a similar change in tendency, with freshening since 1998. For the upper ocean at 24.5°N, 1998 was the warmest and saltiest year since 1957. Data from the Argo network are used to corroborate the strong cooling and freshening since 1998, showing a −0.13°C cooling in the period between 1998 and 2006 and revealing interannual variability between 2005 and 2008 to be much smaller than the decadal variability estimated using the transect. The results also demonstrate that Argo is an invaluable tool for observing the oscillations in the tendencies of the ocean. 1) If say, 40 yr heat accumulation in the ocean (18×10^22 J approx) is not solar-sourced, but energy sourced from the atmosphere (low specific heat) from GHG energy entrapment and moved to the ocean (high specific heat) against the predominant thermal gradient then there must be documentation of this process somewhere with accompanying thermodynamic calculations – what reference is there to this in scientific literature? 2)a) Given the amount of energy involved, someone must have noticed the transfer occurring at the ocean/atmosphere interface and measured the heat transfer in order to quantify it and therefore verify both the phenomenon and enable calibration of global climate models – what reference is there to this in scientific literature? 2)b) I note, possibly unfairly, that NASA’s GISS ModelE wildly overestimates ocean heat uptake in the ARGO era – is it possible that the phenomenon has not been verified empirically and that particular model say (and maybe other models) is not configured realistically (i.e. no GCM V&V has been done re anthropogenic ocean heat uptake)? 3) If I’ve misconstrued the process and it is actually a radiative energy transfer process (or a radiative/sensible heat combination), what reference is available to spectroscopy studies of radiation/sea water interaction to support the contention? I note a number of spectroscopic radiation/water studies e.g. Hale and Querry 1973 (1989 citations to date), indicate that such a process is highly unlikely in view of only about 10 microns penetration in the IR-C range of GHG emittance. 4)a) if the process subscribed to by climate scientists such as the above-named is valid and fully understood, why has the IPCC not actually detailed the process with citations of relevant literature? They only “suggest” and then it is only “likely”, no process is found at 5.2 and 9.5. If AR5 WGI is unable to firm up validity of the above process and detail it with citations, what expectation can there be of credence being given to it by anyone using the report for policy purposes, or any purposes for that matter? Note that the process as described above is not the GHG insulation effect of solar-sourced ocean energy accumulation proposed by Peter Minnett at Real Climate as a result of a single study by NIWA’s MV Tangaroa i.e. Minnett’s posited effect competes with the above as yet undocumented process (as far as I know) to provide a credible anthropogenically driven ocean heat accumulation mechanism neither of which have been adopted by the IPCC to date. Cross posted at The Oregonian (Nuccitelli letter linked at SkS), Skeptical Science (Dueling Scientists in The Oregonian) and Climate Conversation Group (Open Threads, Ocean heat content). At SkS too Andy. I’ve contacted Gordon Fulks, Robert Knox and David Douglass, sending them links to my list of questions at the respective forums. No replies yet. Aside from the physics of the matter, I am somewhat sceptical that they can map the ocean and find warming within fractions of a degree. Land surface temps are hard enough, but a 3D problem like ocean heat has to be somewhat challenging to map. Apologies for the wrong thread. In the case of ocean surface, the mapping is ARGO and fixed buoys and sparse as it is that’s better since 2003/04 than anything prior. In the case of atm over ocean, the mapping is satellite-only traverse. The problem is that, as you allude perhaps Andy, identifying the locations of the ocean surface where the thermal gradient is atm => ocean from time-to-time (if any) at the required accuracy for their process to take place (if even remotely plausible) and huge amounts of energy transferred to the ocean (extremely doubtful). I’m sure there’s not many of those instances because on global average the ocean is about 3 C warmer than the atmosphere. Otherwise they’re saying their atm => ocean heat transfer defies convention. I’m asking for evidence that their phenomenon has been measured but where would such measurements have taken place given the difficulty of identifying atm temp directly adjacent to a buoy say, whether fixed or ARGO, let alone in 3D above, below and along the surface to the accuracy required? These are the little technical difficulties attendant to the main issue that spring to the sceptical mind but not to those glibly espousing the phenomenon. If only the guys at SkS could comprehend same. My first painful task is to get them to address the process as inferred from the quotes and deal with “look over there” comments, let alone obtain a response that addresses the questions one-by-one. BTW, the cool-skin phenomenon is real (documented in Fairall 1996), modification of it by GHG DLR is the Minnett theory (his posited insulation effect). Yes, cloudiness definitely modulates insolation and is largely the explanation for dimming/brightening/albedo changes that change phase maybe twice in 30 yrs. OHC rose significantly during the 90s when there was less cloud cover than usual for example. Over a longer multi-century scale time-frame though I’m inclined to think OHC accumulation has a solar explanation that doesn’t include the cloud factor but I’m not pushing that at SkS. Dr David Stockwell’s accumulation theory has “errors” apparently and besides that’s not the issue anyway. 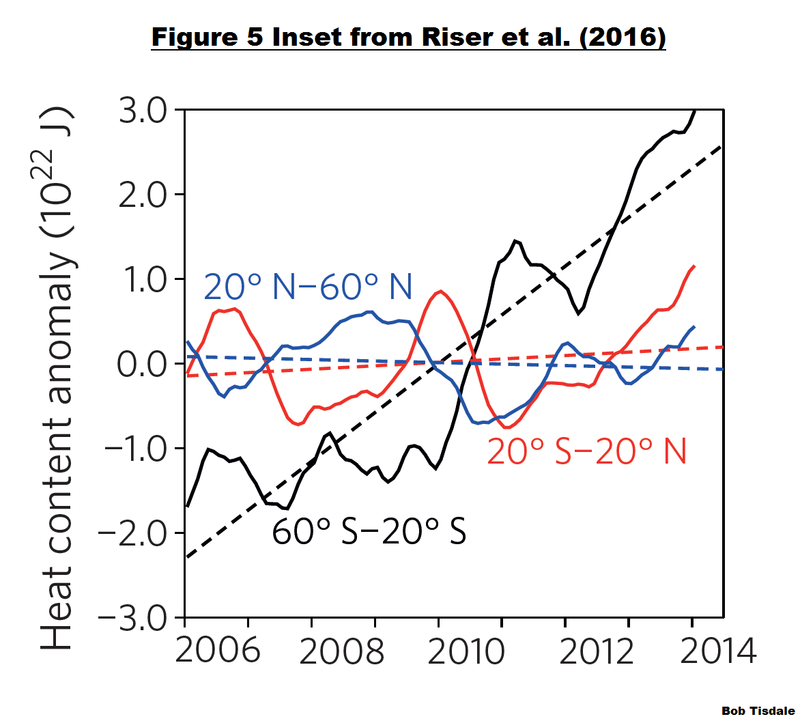 According to pre-ARGO data the oceans have warmed horrendously (Ques 1, 18×10^22 J approx) and this is the crux of the issue. The process I’m questioning attributes ALL of that ocean heat accumulation to heat entrapment in the atmosphere. That heat has then been transferred (apparently, according to the process inferred from the quotes) to the ocean. That is a major thermodynamic process (if it can be proven) to say the least. I’m highly sceptical of OHC metrics but accept them pragmatically for the purposes of investigation (as sceptics do to varying degrees for a number of climate indicators). I only really focus on ARGO era data but even that is highly suspect. We know that Josh Willis threw out a number of buoys (by his self-admission) because they weren’t reading warm enough in his opinion. Bob Tisdale revealed that the UKMO EN3 ARGO era OHC dataset had an opposite sign (negative) to NCDC’s Willis adjusted metric (positive) before EN3 was hastily withdrawn from the UKMO website. Thought my comments at SkS were blocked – didn’t realize they’d gone to page 2. Yes Mike, great that you see it that way. If climate scientists and SkS cohorts continue to assert that anthropogenic global warming heat “is going into” the ocean (and variations on that) then we need to keep asking for: evidence of an anthropogenically-driven-specific phenomenon occurring; the process detail; quantification and actual significance of the process; the documentation; and, the IPCC assessment of it all (what does the AR5 draft say for example, we know what AR4 says). I’m quite OK (a pragmatic acceptance of 0 – 2000m OHC metrics) with the notion that “global warming is continuing” (the current refrain) but in the ocean even though there’s standstill in the atmosphere. I bulk however, at the assumption of anthropogenic attribution by hand waving. I will write up a tidy comment here soon that RT could either uplift or use to compile his own post (he may even be putting something together now) to summarize what I see as the state-of-play in view of the SkS thread. Tricky, because it needs to be concise and tell a story at the same time. Maybe there should be two, an intro and a follow-up, Part 1 and Part 2. As with CS issues, unless people are familiar with ocean/atmosphere interface dynamics, terminology (that’s only just evolving), and the contention and backstory of the aGHG ocean heating issue, the significance of it all is lost on them unfortunately. It is difficult therefore to provide a synopsis in sound-bite form that people can get a handle on, hence the absence of public scrutiny. Meantime, It’s worth the effort to review the SkS post, thread, scientist quotes etc to gain a good understanding of the background in advance of a post going up here at CCG – there’s no rush, this issue is not going away but will only really come to a head if we address it. I placed a comment in Tallblokes ‘Suggestions’ pointing to the SkS thread. Tim Channon responded but said it was out of his scope but of interest to Roger but Roger was away for a few days. Tim left the comment in moderation so Roger will see it so Tallbloke might have something on it when he comes back if his interest is piqued enough. I’ve also notified Gordon Fulks, Robert Knox and David Douglass but no replies so I don’t know if they had a look or not, probably not. My last comment at SkS (76) was removed retroactively (censored) e.g. As for Stefan Rahmstorf, I know for a fact that he ascribes to the mainstream view that greenhouse gases warm the ocean through the reduced thermal gradient in the cool-skin layer. He was involved in a disagreement between myself and other commenters on Real Climate some months back and made his views on this known. Is it really any surprise that he agrees with the established research? AR5 WGI have made a definitive statement (based on GCM simulation studies – nothing observational) as to an anthro ocean heating mechanism (process) and it conforms exactly to the recent Rahmstorf/Schmittner quotes. It does NOT conform to neither does it mention Minnett’s enhanced insulation theory. The IPCC/Rahmstorf/Schmittner mechanism is an air => sea heat transfer mechanism. The Minnett/SkS theory is a sea => air heat transfer mechanism. The direction of energy flow is exactly opposite in the respective cases. The sea => air direction of heat flow for the Minnett/SkS mechanism is however the observed (Fairall et al 96) and conventionally valid thermodynamic direction. The air => sea AR5 direction defies thermodynamic convention because the sea is on average about 3 C warmer than the air. Rahmstorf understood this back in 2006 because he described the conventional sea => air direction of heat flow in the first sentence of Painting’s quote from him. But in 2013 Rahmstorf now subscibes to the non-conventional AR5 mechanism. This is getting messy. I’m not surprised SkS pulled the plug on me. The AR5 mechanism is not ocean-wide (in the models) however so they go looking at individual basins (in the models), see line 25, page 32. At this stage (nothing more at SkS) I will have to write up a 2 part intro and quote analysis in word documents and leave them in Dropbox with links here. Much like a heated kettle of water takes some time before it comes to the boil, it seems intuitive that the world’s oceans will also take some time to fully respond to global warming. Unlike a kettle, however, it’s not obvious how the oceans warm. Adding further greenhouse gases to the atmosphere warms the ocean cool skin layer, which in turn reduces the amount of heat flowing out of the ocean. Reducing the heat lost to the atmosphere allows the oceans to steadily warm over time – as has been observed over the last half century. Not the way the IPCC sees it Rob. SkS have a glitch in their “global” warming going into the ocean meme. Over the last 7 years, “global” warming has been going into the [Indian] ocean, and 70% (2.8×10^22) of the 7 yr World: 0 – 2000 meters heat increase (4×10^22 Joules) has gone into the 0 – 700 m layer of the Indian Ocean. Question is: where did it come from? Pacific? Hydrovents? Skydragon? Ctrl c/v to copy/paste. Please report any typos, broken links, dumb stuff etc. Will send this series to Joanne Nova and Roger Weatherall (TallBloke). While we’re on the topic of sea surface temperatures, let’s take a look at this paper from 2013, that I don’t recall the BBC or Guardian reporting! This paper demolishes the idea that CO2 has been responsible for the warming of the seas since the Little Ice Age. I’ve included Figure 5 from Riser et al. (2016) as my Figure 1. Let’s zoom in on the inset graph of the ARGO-based data included in Figure 5 from Riser et al. (2016), my Figure 2. NH and Tropics are flat. The global metric is skewed by SH Extratropics i.e. looking at the global metric is only really looking at the SH Extratropics. And I suspect the SH is skewed by the Indian Ocean i.e. looking at the global metric is only really looking at the SH Extratropics of the Indian Ocean.